VCCA is now accepting reservations for the 2011 Auvillar Arts Workshops at Moulin à Nef. "O Taste and See: Writing the Senses in Deep France"
"How I See It: Autobiography in Impressionist Poetry and Prose"
To learn more, click on the green button above. If you know an artist who meets the following criteria -- and has never been to VCCA -- please forward this information. VCCA's 2011 Wachtmeister Award for Excellence in the Arts will be given to a visual artist working in two or three-dimensions. Photography will not be considered for the 2011 Award. Criteria: Applicants must have worked professionally for the past 15 years and have demonstrated achievements in their field. This award is for artists who have not previously been in residence at VCCA. 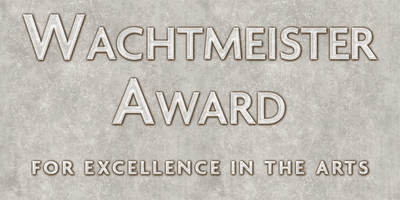 The Wachtmeister Award includes a fully-funded residency (up to 30 days) at VCCA, a $1,000 honorarium, and reimbursed travel expenses of up to $750. Total value of the award is $7,150. Postmark deadline is February 15, 2011. Click here for more information or an application. Helen Estelle Thompson passed away on Friday, November 5, 2010. A breakfast and lunch cook for VCCA throughout the 1980s and early 90s, Helen fixed innumerable sandwiches and filled countless lunch boxes for hundreds of Fellows over her many years here. 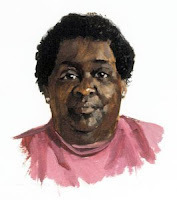 Helen, shown above in a portrait by VCCA Fellow Anne Kesler Shields, was the mother of longtime VCCA employee Cora Tabb. 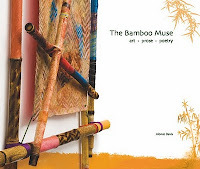 VCCA Fellows in Alonzo Davis' book, "The Bamboo Muse"
The Bamboo Muse, Art • Prose • Poetry, written by VCCA Fellow and former board member Alonzo Davis, includes work by VCCA Poets Deborah Ager, Marjory Wentworth and Kay Lindsey. To preview The Bamboo Muse, Click Here. Annual NY Fellows' Reunion THIS EVENING!